We’ve all had problems with eyeglass glare, right? Even the antiglare eyeglass lenses still cause problems. Well, there are a couple of ways around this. 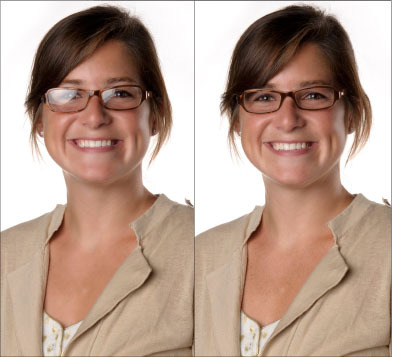 The first way demonstrates how to avoid eyeglass glare at the time of capture, while the second method is a short video showing how to combine photos in Photoshop to fix a glare problem. One way to get around this during the shoot is to have the subject tilt her glasses down (push the frames up near the area that rests on the ears). Here’s a side view of what it looks like. Keep in mind that a little bit of an angle makes a huge difference. It will probably feel a little weird for her and you’ll want to assure her that it’s not noticeable in the final photo. Here’s a before and after example where I used the same technique. As you can see, the change is negligible as far as the appearance of the glasses from the front. You can barely see it, and it was all done in camera. If you don’t wear glasses, it will be hard to demonstrate to your subject what you mean, and she’ll do all of these weird, contorted things with her glasses. You can either ask if it’s okay if you adjust her glasses, or if she doesn’t feel comfortable having you that close (some people are really aware of personal space), then have a pair of “stunt” glasses and demonstrate. Sometimes this simply won’t work, no matter how much you tilt the glasses. 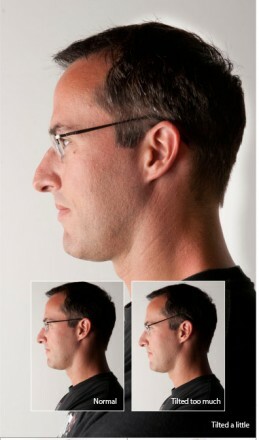 If the person has little or no hair, the tilted frames are indeed noticeable in the photo. In that case, you can take photos with and without the eyeglasses and combine them later in Photoshop. It’s literally a three-minute fix. Check it out. I use these and you can also raise your light a little higher too..
is there supposed to be a video attached? What are the third and fourth ways? Regarding the second method, I didn’t see a place to “check it out”. I’m definitely interested in learning that method. Regarding the second method, I didn’t see a place to “check it out”. I’m definitely interested in learning that method. What are the third and fourth ways?